The Minolta Flash Meter series was started in 1969 with a light meter bearing the same name. That original Minolta Flash Meter was an analog measuring instrument with a color-corrected silicon photo cell as light sensor. This element was developed and produced by Minolta itself, as well as the whole flash meter. The meter needs one AA-battery and five PX625 batteries. The analog instrument's scale changes when the ASA-preselector on the meter's top is re-adjusted. Then the EV-value scale stays, but the scale of corresponding apertures is shifted right or left. When the right ASA film speed value appears over the scales the measuring can be done. The meter's front side shows the instrument and the preselector for the shutter speed. The instrument's needle shows an approriate aperture value for the preselected film an shutter speeds. Therefore the big metal button on the meter's side must be pressed down. Then the needle shows the EV of the moment of pressing down the button. On the bottom are two connectors, one for a remote sensor and one for a flash firing cable. When a flashgun is connected the meter can be used in a dark room. When its big button is pressed the flash is triggered synchronized to the moment of measuring. The instrument's needle keeps staying over the measuring value as long as the button is pressed, and a little lamp over the scale makes it readable in the darkness until the button is released. Another small button serves for the battery check. The sensor is located behind a round hole in the meter's back. The hole is a screw mount for the diffusor. One of several different diffusors can be chosen. 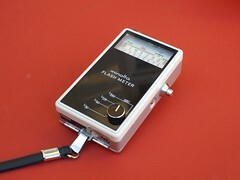 In 1976 the series was continued with the Minolta Flash Meter II which had an LED display instead of an analog instrument scale. In 1980 the Minolta Flash meter III followed. It had a more versatile LCD display and a built-in digital micro-controller. 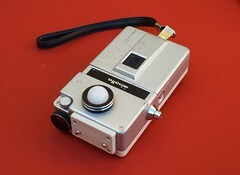 This kind of flash meter was further developed until the appeareance of the Flash Meter V in 1995.